Little Free Library’s are popping up all over the world and now one is here in Delray Beach at the corner of NE 1st Avenue and 4st Street in front of Preferred Care at Home. The concept is simple: take a book; leave a book. This little house-shaped library offers an ever-changing variety of books so people of all ages can pick up a book for free. Preferred Care at Home has gone one-step further and created bookmarks. These bookmarks allow for people to write their thoughts and comments about the book as it is passed around the community. Preferred Care at Home also offers complimentary delivery or pick-up services for homebound seniors living in Delray Beach that would like to read or donate a book. 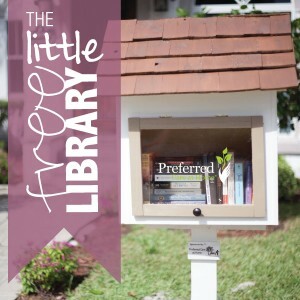 The Little Free Library is located at 354 NE 1st Avenue, in front of Preferred Care at Home. Bring your book donations to Preferred Care at Home or simply leave them in the Little Free Library. For questions regarding Preferred Care at Home and its Little Free Library, contact Chad Farmer at 561-404-2300. Since 1984, the founders of Preferred Care at Home have been dedicated to providing reliable, compassionate and affordable home care. This care improves quality of life while safeguarding independence and dignity. Services include companionship, meal preparation, hygiene reminders, medication reminders, incidental transportation and more. Preferred Care at Home is a nationally franchised company based in Delray Beach, Fla.